This route combines the two best parts of Sequoia National Park — alpine scenery and giant sequoias — into an exceptionally enjoyable hike with a nice progression of different environments. It’s a great introduction to the park. The hike starts in ordinary pine forest without any sequoias, but with really nice alpine views, an unusual thing in the General’s Highway area. Then there’s a long descent through patchy sequoias at the edge of the Giant Forest. Finally, the hike passes through the most impressive part of the Giant Forest, with lots of immense trees. The hike starts at the quiet Crescent Meadow parking lot. The start and end of the hike is lot more enjoyable when you can actually park at Crescent Meadow, but unfortunately, visitors aren’t allowed to drive there on summer weekends and holidays between 9 am and 4 pm. Instead, from late May to early September there’s a shuttle that runs from the busy Giant Forest Museum between 8 am and 6 pm. When there’s snow on the ground, the lot is always closed and there isn’t a shuttle. 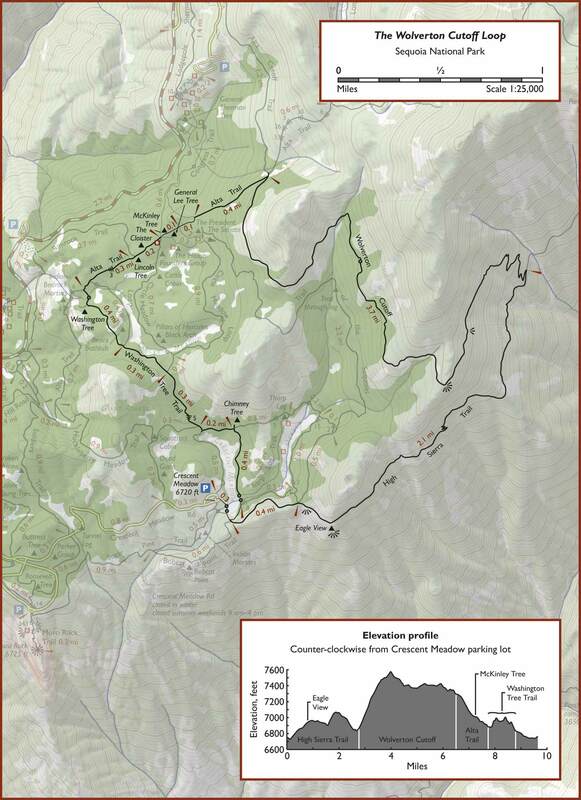 If the road to Crescent Meadow is closed, an alternative is to park at the Pinewood Picnic Area just off the Generals’ Highway and hike in on the Rimrock Trail, adding 1.7 miles to the hike. A large sign marks the beginning of the High Sierra Trail, which runs all the way to Mount Whitney. Follow the paved trail for a few hundred yards, then turn right to begin climbing a slight hill. The next trail intersection is at a saddle where a few sequoias grow. Turn right again to stay on the High Sierra Trail, which emerges from the forest onto an open hillside. As the trail rounds the corner at Eagle View, the alpine scenery first comes into view. The imposing snow-capped peaks of the Great Western Divide are the most dramatic part of the view, but the broad green valley of the Middle Fork Kaweah River and the tall granite spires of Castle Rock add to the alpine feel of the area. The High Sierra Trail is wide, well-maintained, and mostly flat. The trail passes through sunny, open pine forest with occasional glimpses of the alpine scenery. There’s a little bit of climbing, then as the trail starts to descend slightly, the forest gets denser and there aren’t any more views. Turn left onto the Wolverton Cutoff Trail. The narrow, lightly used trail (I’ve hiked it a few times and have never seen anyone else on it) switchbacks steeply uphill. It’s a little dull at first since the dense pine forest blocks any views. Eventually, though, the woods open up, allowing some views of the valley below. The alpine scenery culminates in a breathtaking viewpoint at the highest point of the hike. An easy stroll onto a low rock face brings a dramatic, sweeping view both up and down the Middle Fork valley. To your left, conifer-carpeted hillsides slope upwards toward the snow-capped Great Western Divide. The clear whistle of a bird sounds repeatedly. This makes a great place to take a break as it’s both the literal and figurative high point of the hike. About a third of the trees on the lower east side slopes are now dead due to the plague of bark beetles affecting the entire Sierra, but the west side of the valley and the upper elevations seem to be unaffected. 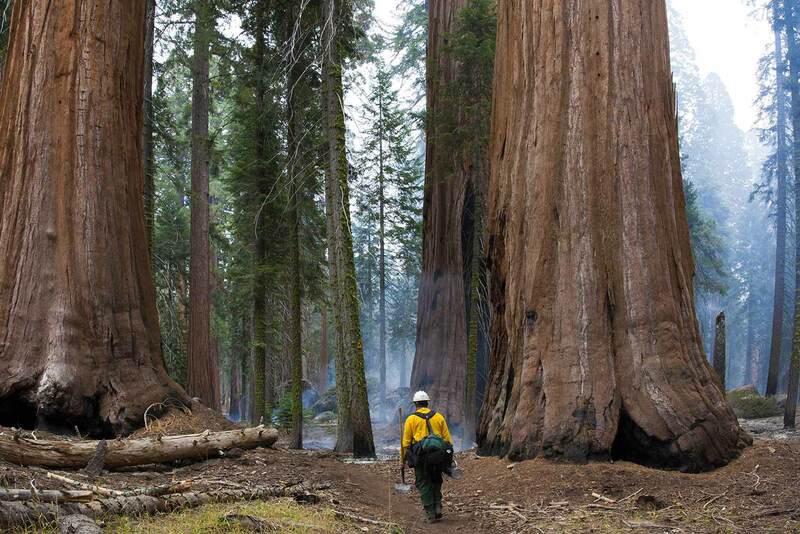 Immediately after the viewpoint, the trail rounds a corner and the first sequoias appear. Over the next few miles the trail runs alongs the edge of the Giant Forest, passing through several patches of sequoias interspersed with ordinary pine forest. The trail gets few visitors and is well away from roads, so it’s very quiet and doesn’t feel at all touristy. The best scenery is often found at the edges of sequoia groves, and this is no exception: the Wolverton Cutoff has some unexpectedly nice sections of old growth. Even compared to the Trail of the Sequoias, which is just a few hundred yards down the hill, the forest is very open with relatively few understory trees to block the views. Much of this area is lightly wooded, with an unusually luxurious carpet of ferns growing among the sequoias. There are also heavily-wooded areas that have fewer or no sequoias and no groundcover at all. 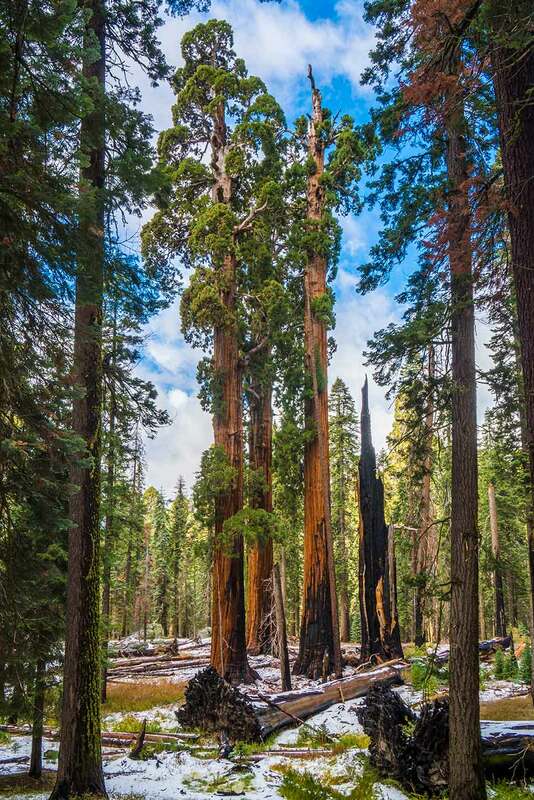 The sequoias are richly colored, with a distinctive orange hue. At one point the trail contours around a large ravine with an especially scenic collection of big trees. After that the woods become a little less interesting until the trail starts to descend to the intersection with the Alta Trail. The trail intersects the Alta Trail in a little fern-filled meadow surrounded by a striking collection of towering sequoias. Although few visitors make it here, I think it’s one of the most beautiful spots in the Giant Forest. It’s worth taking a little detour and walking up the Alta Trail for a few yards to get a better view of the meadow. From the meadow, the trail passes through an unsually tall patch of ferns that sometimes gets up to chest high by the end of the summer. It then descends through a shallow depression alongside a burbling (but unseen) creek. A narrow strip of lush groundcover runs along the bottom of the depression, mostly lupines that bloom purple in the early summer. Turn left onto the paved Congress Trail. 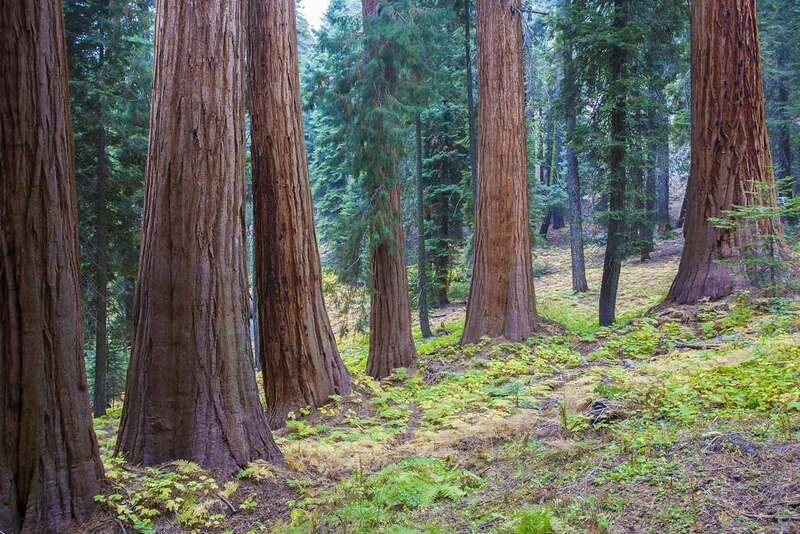 The forest in this area has a rather stark, severe appearance because it lacks groundcover or understory foliage, but it has the biggest sequoias of the hike, and some truly impressive mammoth trees can be seen right next to the trail. At the next two intersections, continue straight ahead on the Alta Trail. At the second intersection, leave the paved loop and begin a gentle descent along a low, wide, gently-sloped ridge. The severe, otherworldly appearance and the immense trees continue. Turn left on the Washington Tree Trail, which climbs a gentle slope. After the trail crests it comes alongside Circle Meadow, where the landscape becomes noticably lusher and more attractive. There are some nice views of the narrow sequoia-ringed meadow on one side of the trail and some pretty impressive sequoias on the other. The big sequoias continue as the trail climbs a slight hill, but then the trail becomes less scenic as it descends to Crescent Meadow. Surprisingly, Crescent Meadow only has a few scattered sequoias, but the grand alpine meadow is nontheless quite scenic. I prefer to take the trail on the east side of the meadow, which is about a half-mile longer but more attractive than the west side trail.